A special baked chicken coated with lots of fresh rosemary, thyme, and sage, and a crispy almond covering. 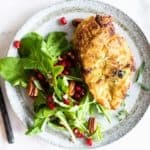 The perfect easy baked chicken to make for holidays, when you need something easy and special. Easy enough for a weeknight meal, or meal prep! Add the marinade ingredients to the chicken, and mix well to evenly coat. Allow to marinate for at least 20 minutes, up to overnight. Add the egg to one bowl, and beat it. Add the almond coating ingredients to another bowl, and mix to combine. Take each piece of chicken, and dip it in the egg wash, and then dredge it in the almond flour mixture. Place on a baking tray. Using parchment paper makes it easier to remove from the pan, but it will brown more if you place it directly on a baking sheet greased with olive oil. Bake for 15 minutes, and then gently flip over. The coating will be soft and fragile at this point, but will brown as it continues to bake. Bake another 10-13 minutes, until well browned. *1 teaspoon each of dried herbs can be substituted for the fresh herbs.